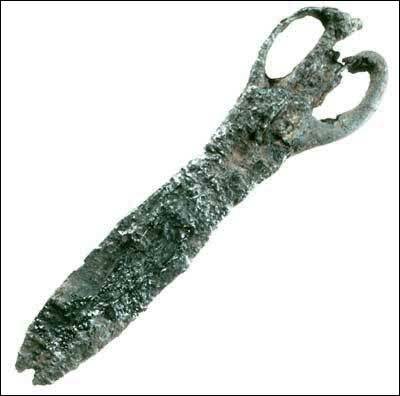 Approximately 10 cm long, it is one of a number of scissors and shears found in many areas, and dating throughout the 17th century. Broken windowpane from the Kirke house midden, which indicates the upper-class nature of the dwelling. What appears to be a scratched inscription near the center is indecipherable. 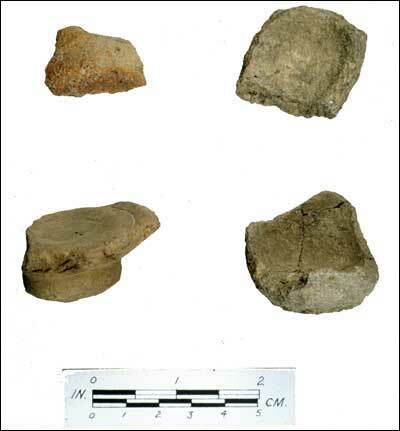 Fragments of crucibles and cupels, found in the earliest layers of the waterfront warehouse, indicate that an alchemist, or goldfiner, was assaying local rocks in a search for precious metals during the first years of the Avalon settlement. 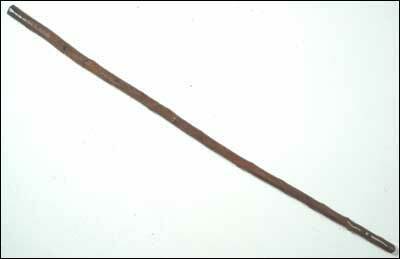 Approximately 30 cm long, this notched stick from the privy is a tally stick, commonly used for record-keeping during the 17th century. 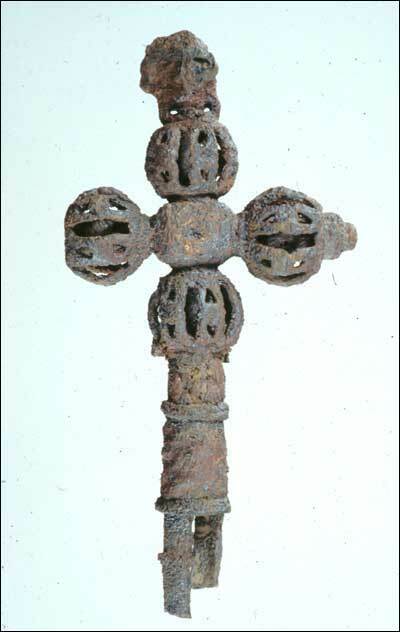 Ornate iron cross which has the interior of the orbs, and the socket into which a wooden shaft was fitted, lined with brass. Traces of gold on the surface indicate that the cross was once gilt. Its origin remains a mystery. It was in the forge at the time it was destroyed around the mid-17th century. 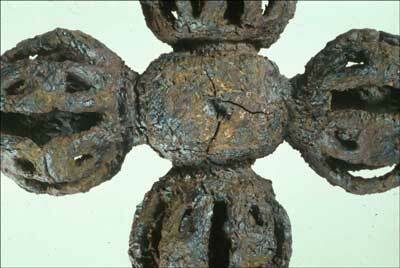 Detail of iron cross, showing traces of gold in the central portion. 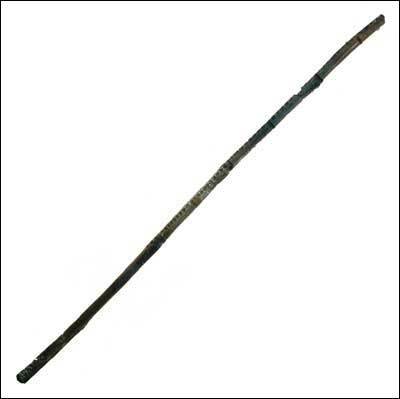 Walking stick of English holly (ilex aquifolium), brought from the British Isles and discarded in the privy about mid-century. 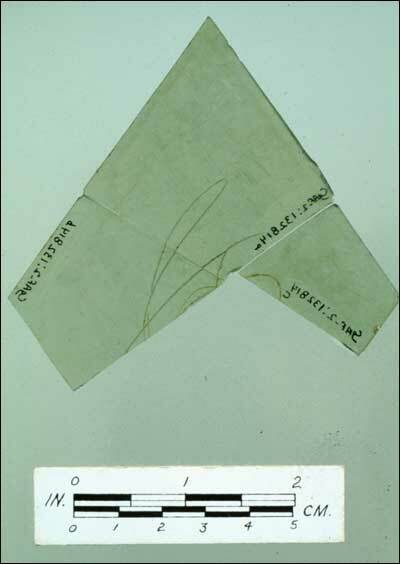 A perforation in the upper end probably once held a leather thong. 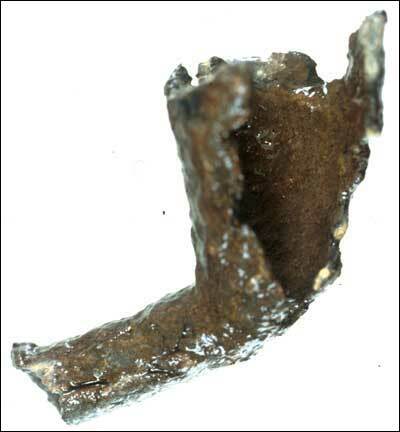 Fragment of a pewter tobacco pipe from the waterfront. It probably once had a wooden stem. 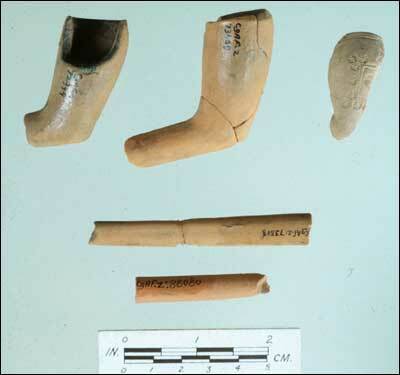 Fragments of red clay pipes manufactured in Virginia or elsewhere in the Chesapeake, which probably arrived at Avalon with shipments of tobacco. 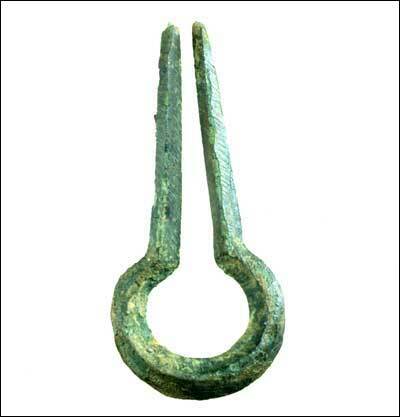 Approximately 5 cm long, the mouth harp was found on the floor of the cowhouse destroyed in 1696. ©1999, James Tuck, Department of Archaeology, Memorial University of Newfoundland.